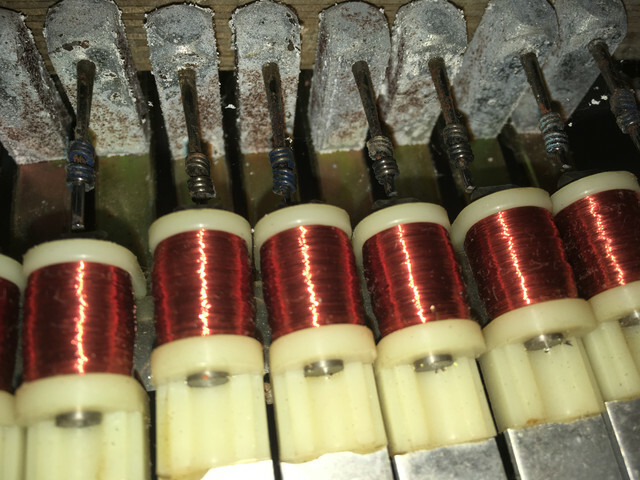 I found a 1972 Fender Rhodes Stage MK1A for sale for $750, and I am trying to determine if the price is accurate for the value as well as any repair/maintenance costs. I am an aspiring Rhodes enthusiast (this would be my first Rhodes, despite the username ). I can tell already that a lot of work needs to be done. I am willing to do the work but my main concern is the investment cost. It has been sitting in an antique store for the past 2 months and the shop has no information about the previous owner or really much of anything. It plays with the exception of the bottom 2 notes (which I believe to be dead pickups) and 2 of the highest keys that get stuck and don't produce sound. I did the screwdriver test and found all but 4 pickups work. Some pickups appear to be quieter than others, especially in the higher range. 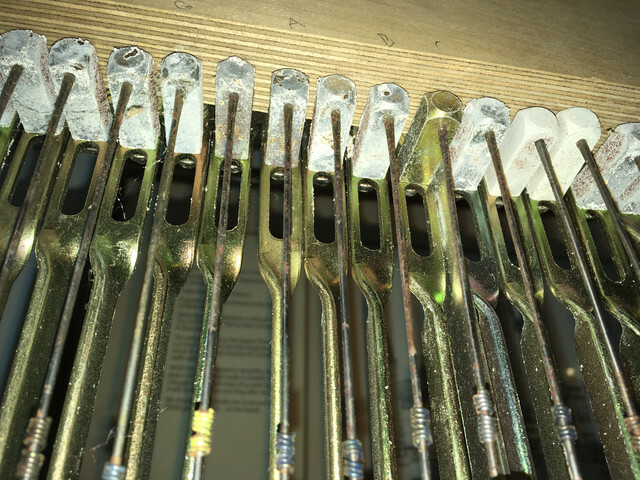 The tines are rusted, and the tone bars moderately so. I have seen a few rust removal methods already such as using kerosene and sandpaper. Would I be able to save them with a bit of elbow grease? The hammers strike true with the exception of one. The tips have a wear line and look like they need to be replaced. The dampers are also heavily worn. The case is ratty but I am less worried about cosmetic issues at the moment. I also tried to set up the sustain pedal but I couldn't get it to function. This might have been user error. I have a low budget, so I am looking to prioritize possible repairs. My goal is to get the best authentic Rhodes sound that I can for as little as possible (isn't everyone). What are the first steps in this possible restoration process? and.... How much will it COST? 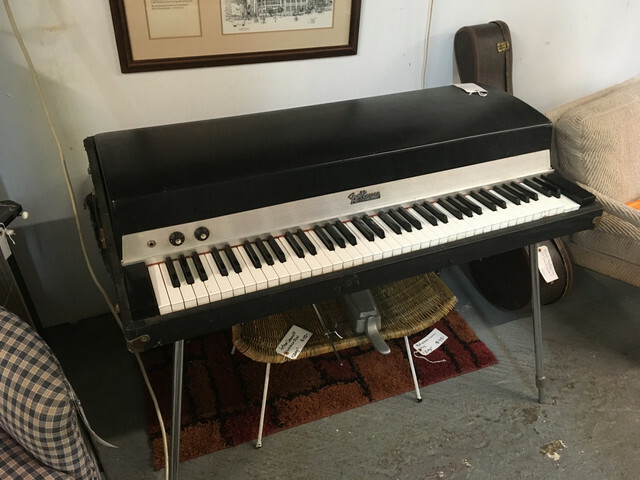 Found a Rhodes for cheap and want to know if it's worth the potential cost to fix up. I have attached pictures for reference below. 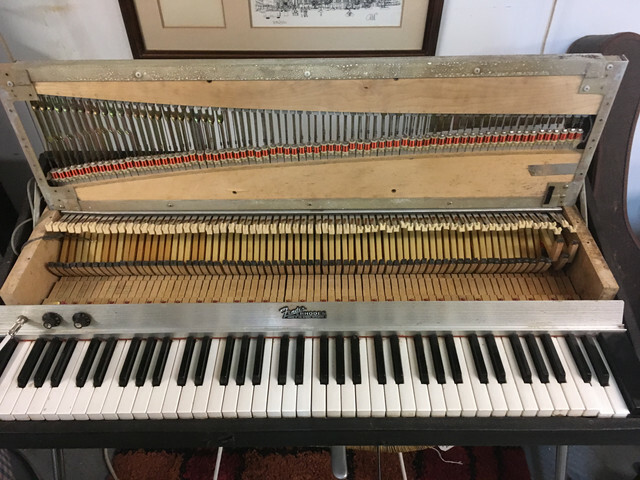 I think the price is too high based on the current condition of this Rhodes. But don't pass this one up. 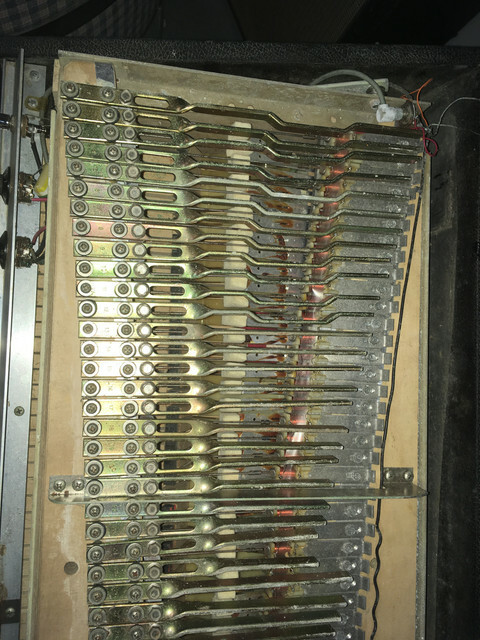 The corrosion of the tines, tine blocks, and tonebars is a tedious clean-up job. The tolex is trashed, so you will eventually have to replace it. It clearly indicates that this Rhodes was ridden hard and put away wet. The wood looks pretty moldy too. It is missing the logo on the audience side of the case. Some of the sphinx glides are missing (little round sliders on the case). It is concerning that you couldn't get the sustain mechanism to work, because that is pretty simple. You should go back and give that another try. Check to see if the damper release bar has popped out of the pivots at the ends. It shouldn't be a problem, you can get it all put back in the right place and working without much trouble. 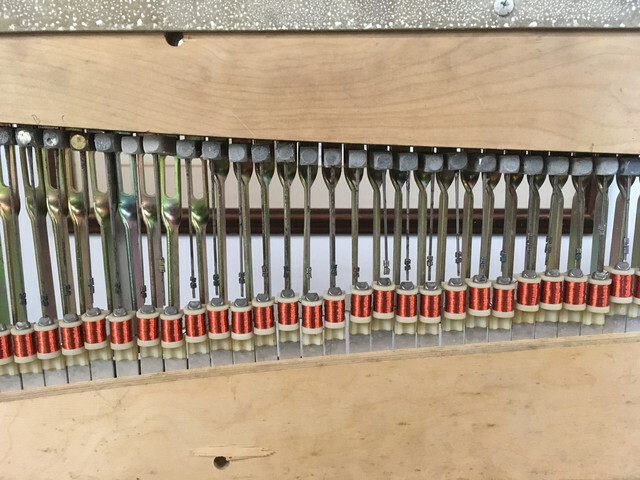 Judging from the rough treatment this piano has seen, maybe some of the parts are out of place. Check to see if water damage and abuse has weakened the case. Check for separation at the corners. Order new grommets. (I am cheap, so I would get the McMaster-Carr grommets, but see https://ep-forum.com/smf/index.php?topic=9776.msg54209#msg54209. See also the grommets available online from Vintage Vibe, et al. Take it all apart and clean off the rust and zinc corrosion. 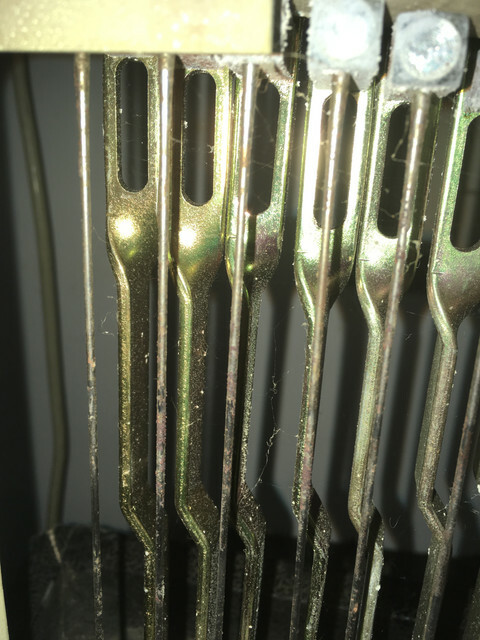 I might try Evaporust on some of the tines, but if the rust isn't very deep, I would simply clean them with oil and leave them be. The harp frame can be cleaned, sanded, and painted gold with spray paint. I don't have any personal advice about what to do about the mold. When the grommets arrive, put it all back together and re-set the voicing and escapement, and touch up the tuning. 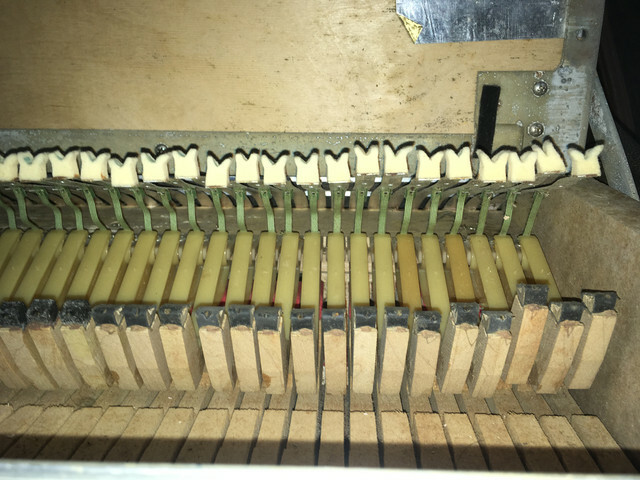 Play it for a few weeks, and then decide if you are ready to replace the hammer tips and the damper felts. I really like the square hammer tips, but you have options. When spring and warm weather arrives, you can tackle the tolex job. Then order the replacement logo and new glides. This year of Rhodes is pretty nice to have, and you will grow to love it. When restored, this will be a keeper. It still has the old-style small hinges on the back, doesn't it? Yikes! Yours is missing the hinges. The control plate on the name rail is mounted about two centimeters to the left, so the output jack is about one key lower (it sits over the A instead of Bb) -- Nope, yours is earlier, so yours has no control plate, and the jack is way down between E and F. Nice! Thanks a lot for the info Sean! I definitely will head back and give the sustain system another try. Clean the rust and zinc corrosion and get grommets first. Got it! Will definitely look at the miracle mod down the line. Since you say the price is too high for the current condition, what do you think a fair price would be? What do you suggest I try and counter-offer? 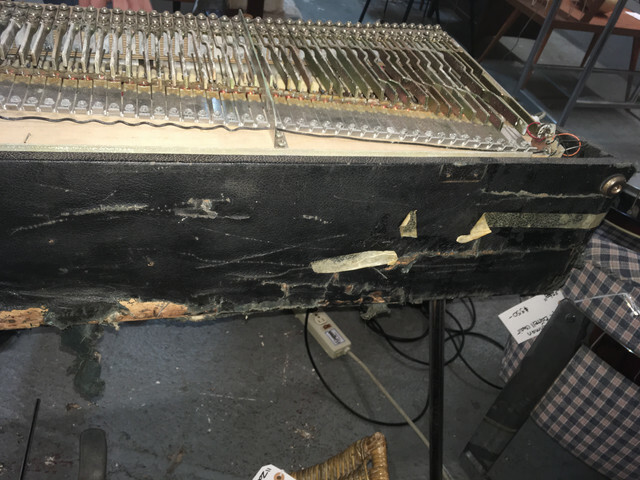 Patiently and carefully explain the list of things wrong with it, and explain how expensive it will be to have the rust and mold removed and the tolex redone. Don't look eager. Explain that the missing cross bars will cost a lot to replace ($100.00, but they are currently out of stock at VV). Explain that it needs new grommets, new hammer tips, and new felts. Also that it needs new spark plugs and tires. If they take it great. If they don't, then stare coldly at the Rhodes for a few minutes, and offer them $550. Then $600. If they don't take $600, walk out and leave. Then go get the $750 and buy it a few hours later. No wait. After a few hours, send your buddy in to the shop to offer them $450 for it. Then come back wearing a fake mustache, and start at $500 again. No matter how the deal works out, you are almost certain to get much more than $750 of enjoyment out of your first Rhodes. Oh, but be careful, this will not be the first one that you buy. There will be others.